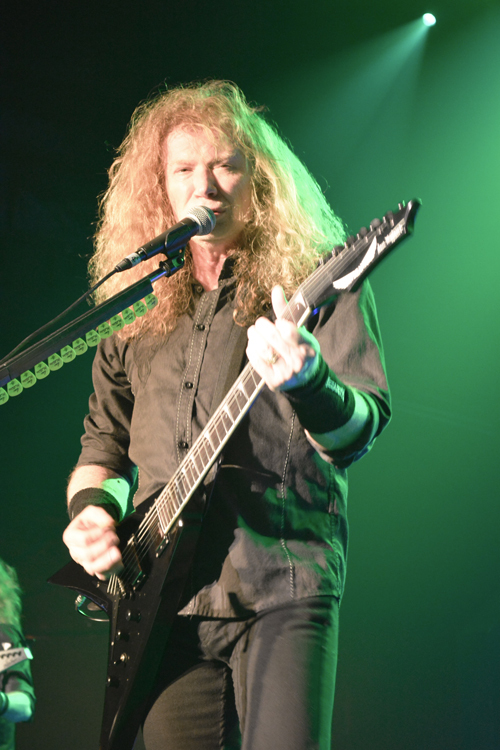 If the wildly popular and highly sold Dystopia World Tour is any indication of the current path MEGADETH is following, it is quite easy to say that the band has returned to the metal fold in the biggest possible way. The kickoff show in Dallas on February 20th was at maximum capacity for the Southside Ballroom and fans of all ages clamored to hear old favorites as well as new tunes. Vocalist, guitarist and band visionary Dave Mustaine promised us something special with this new record and he and bassist David Ellefson have not disappointed us yet. 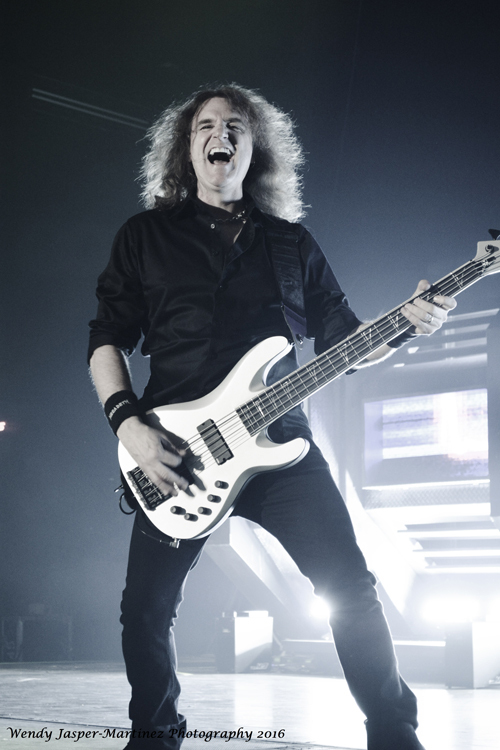 While the anticipation built for the album’s release, the question of how the band’s sound would be affected by member changes was questioned by fans and press alike; and then the album dropped and Dystopia debuted at number three on the Billboard 200 chart on January 22, 2016, making it their highest charting debut since Countdown To Extinction. Fans were also excited to get a glimpse of new guitarist Kiko Loureiro (ANGRA) and drummer Chris Adler (LAMB OF GOD). 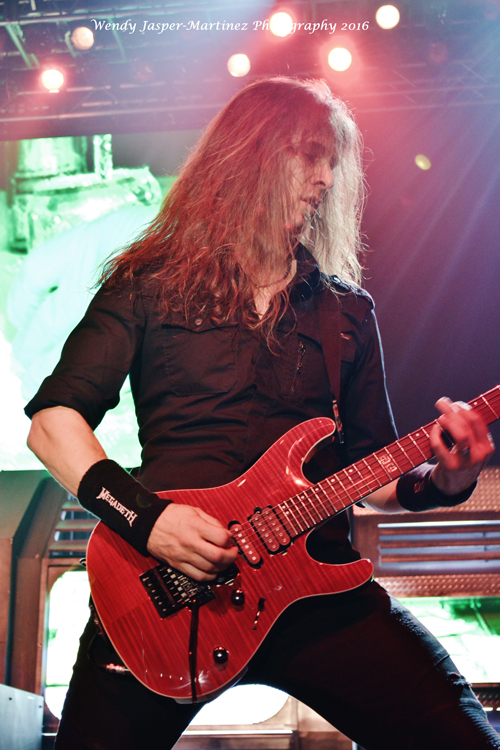 Both artists had extremely large shoes to fill after the departures of Chris Broderick and Shawn Drover, who had shared the stage with the band’s founders for over a decade and left in 2014 to start their new band, ACT OF DEFIANCE. It is easy to remain objective regarding member changes because this does not even seem like the same band. While new members must learn the classics, the new music is a complete departure from anything that has been released in the last ten years and carrying the sound live was not a problem for Loureiro and Adler. The show opened with the strains of "Hangar 18" and moved swiftly into "Kingmaker". With decades of material to choose from, it appears that Mustaine and company made a concentrated effort to cover all eras of the band in representative fairness. The strongest songs from each album were chosen for the opening night set and as the pit began swirling to the strains of "Wake Up Dead", they effortlessly changed energy as the band launched into "In My Darkest Hour". This song is a definitive MEGADETH tune for me as both a writer and a fan. It was the song showcased in Penelope Spheeris’ masterpiece documentary The Decline Of Western Civilization Part II: The Metal Years (1987) and it marks the time period in which we find that MEGADETH was coming into their own and could not be pigeonholed into the thrash genre as they were actually capable of a more melodic and temperate sound that would make them a true metal crossover band. The night continued with "She-Wolf", the anthemic "Sweating Bullets" and "Dawn Patrol" and the pit commenced as "Poison Was The Cure", "Tornado Of Souls" and "Trust" swelled through the room. The debut single from Dystopia, "Fatal Illusion", was the only song the band played from the new album but it was well received and the crowd was boisterous. Mustaine then slowed the crowd down a bit with the intro to "A Tout Le Monde". 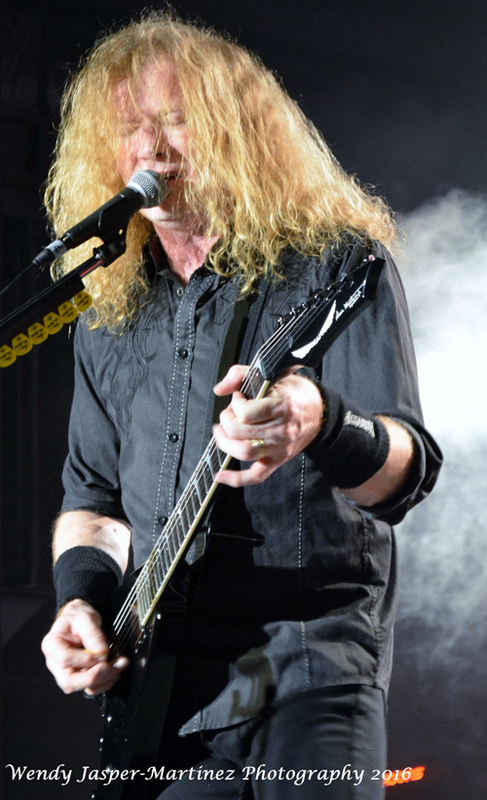 This song, based on reports from subsequent shows, has not stayed in the set list for every city and it appears the band has been treating different audiences to different tunes; however, this song has been a staple since its release and it appears that Dallas loved it as the entire crowd sang along with Mustaine and it was, in essence, the audience participation tune for the evening. "Skin O’My Teeth", "Symphony Of Destruction", and "Peace Sells" ended the evening, with the band returning for their standard encore of "Holy Wars…The Punishment Due". All in all, it was what any fan would expect from a MEGADETH show and the band exceeded my expectations for the night. It was fun, well rounded, and offered what the fans seemed to need and want from the band; affirmation that MEGADETH is here to stay and is stronger than ever. The remaining tour dates run through August and take the band to international locales. It is expected that they will continue to showcase the album through the end of the year.